We often empty the Recycle Bin to free up hard disk space. Sometimes we empty the Recycle Bin then find that a useful file is deleted. how to restore it? you might think that the file is permanently gone. In fact, your operating system doesn't completely erase files right after they were deleted. In reality the space freed is marked as available, but the files are still there. That is why after the files were deleted you have to really act as fast as possible before they get overwritten. Ideally you should stop using the drive/partition,and restore deleted files with Best file recovery software after empty recycle bin. Bitwar Data Recovery is a fast and reliable file recovery software with more file types supported and powerful functions to help you recover permanently deleted files from the emptied Recycle Bin. It allows you to preview all the deleted files before you recover it. Here is the detailed guide about how to restore deleted files after empty recycle bin. Download and install Bitwar Data Recovery software on your windows, Mac OS can install Bitwar Data Recovery for Mac. Please DO NOT save or install any files in to the partition where the deleted files once existed. launch it and follow the step by step guide and recover deleted files from recycle bin.DO NOT save other files or install softwares to the partition where you want to recover files from Recycle Bin. NOTE: Many people think of the Recycle Bin folder on the system disk. but The actual location of the Recycle Bin depends on the type of operating system and file system. On older FAT file systems (typically Windows 98 and prior), it is located in Drive:\RECYCLED. In the NTFS file system (Windows 2000, XP, NT) it is Drive:\RECYCLER. On Windows Vista and Windows 7 it is Drive:\$Recycle.Bin folder). The Recycle Bin of the desktop links each partition's Recycle Bin, which can be considered as the sum of the recycle bins for each partition. 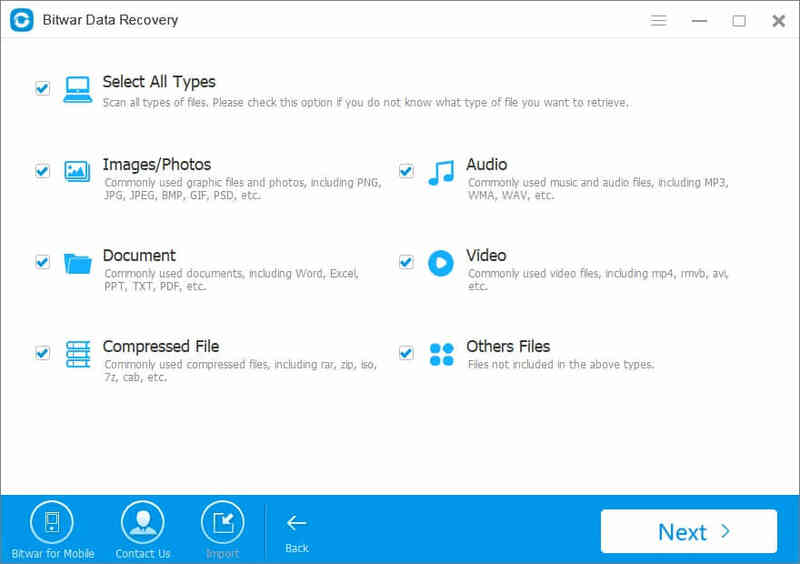 Launch Bitwar data recovery program and you can see 6 different recovery mode on the main page, each of them focuses on different data loss scenarios. Please select “Recycle bin Recovery” if you want to restore deleted files after empty recycle bin. Select the types of files which you want to recover.Bitwar data recovery can scan and recover all types of files. If you want to recover all types, select “Select All Types”. then click next to start scanning recycle bin for each partition. During the scanning, the scanned Data will show on the dashboard. Once you found the deleted files you need, you can stop scanning process and preview/recover it. After scanning is complete. you can filter through the file name, type, path, and time in the tree list on the left. You can preview them and make a selective recovery. You can also export all scan results to a specific location after a scan, so that you can load previous results without a rescan when you need it. BUT, please do not export results to the location where data loss appears, because it may overwrite lost data.When you find the deleted files, select it and click the "Recover" button to save it to another partition or external device. You should save the recovered files on another partition different from the source partition to avoid data overwriting. Thanks for Bitwar Data Recovery to restore deleted files after empty recycle bin.besides of that, it can recover deleted and formatted files from hard drive, external hard drive, SD memory card, USB flash drive, USB thumb stick, camera, etc. 1. Files deleted by hitting Shift+Delete will not be listed in recycle bin.to recover it,you should use “deleted files recovery” of Bitwar Data Recovery. 2. Files removed from portable device which is connected to computer will not been stored in recycle bin. To restore it you should use “usb memeore card recovery” of Bitwar Data Recovery. 3. Files that are formatted or lost from the device or partition will not appear in the Recycle Bin and you can use “Formatted hard drive recovery” of Bitwar Data Recovery. 4. Files that are from the lost partition will not appear in the Recycle Bin.you should use “Lost Partition recovery” of Bitwar Data Recovery. 5. If files are not found under above recovery mode,try deep recovery. The deep recovery will scanning all the files with a detailed scanning algorithm. but files scanned in this mode will not display its names and the scanning may take longer time. Next：How to Fix ＂Recycle Bin is Corrupted＂ Error? Summary：Do you want to empty the Recycle Bin for this drive?” ,and when the Recycle Bin is corrupted, you might be unable to delete files to recycle bin, you’ll also get the box below. How to Fix "Recycle Bin is Corrupted" Error?